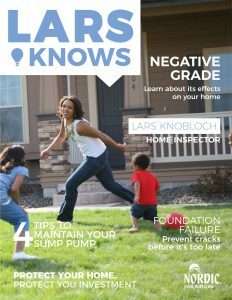 Lars Knows Good Grade | Nordic Companies Inc.
Click the cover above to print or download a .pdf version of this article! Extreme weather is becoming more common in our area with conditions that fluctuate from very wet to very dry within a matter of days. It is possible to have no water in your basement even if you have a negative grade around your home, but the issue should be addressed to prepare for that sudden rainfall that could mean a wet situation in your lower level. Let’s take a look at what’s happening around your home, and what could be lurking beneath. Negative grade is when a home’s yard and landscaping slopes toward a structure instead of away from it. This creates a direct path for water to flow to your home, and it is never a good scenario. Pooled water will drain alongside your foundation, collect below your home and could result in a heaved floor in your foundation, as well as increasing seepage and humidity in your home. 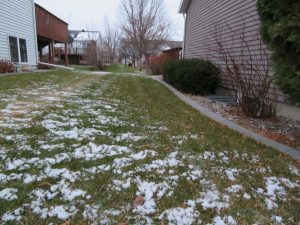 Take a look around your property and measure the grade of your lawn. It is recommended that landscaping should slope 1” per foot around the perimeter of your home, to 5’ away from your foundation. 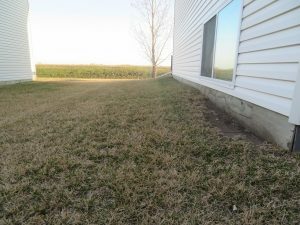 Downspout extensions should be out at all times, depositing runoff 6’ from your home. Patios, driveways and walkways should also be designed to slope away from your home. If your grade isn’t positive, or sloping away from your home, you have what is called negative grade. This can be remedied in two ways. First, you can add black dirt to increase the slope. It is important to use pulverized black dirt for this, not rock, sand or clay. Black dirt keeps a better balance of moisture and won’t show the drastic effects of wet/dry expansion/contraction as much as clay based soil will. Rock and sand provide little to no water retention at all. You can also create a positive grade when you swale the terrain. This is basically shaving off the soil to create the proper slope needed to shed water away from your home. Sump pumps and drain tile are designed to effectively remove water naturally occurring below your foundation. While they also mitigate drainage from rainfall, it is only responsible to do the best we can to flow water away from a home. 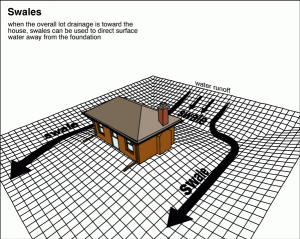 The first and most drastic result from standing water around your home would be foundation failure. Soil in the Red River Valley area is made up from roughly 90% clay. When clay is exposed to water it expands. This will cause water logged soil to push against your foundation and break it. 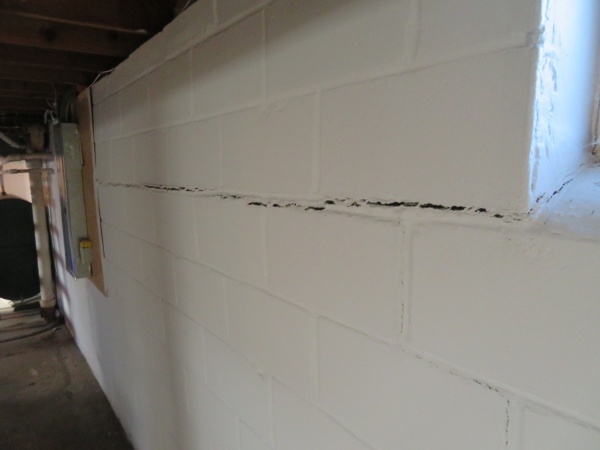 Commonly, this pressure will cause vertical cracks in poured concrete foundations and horizontal cracks in block foundations. It is important to have these cracks assessed and repaired. Major damage will result in a basement that needs bracing. Smaller cracks should be patched with polyurethane or epoxy caulk to prevent further seepage. Conversely, drought in the area will cause the clay based soil to shrink. This will trigger a home to “settle” or shift. It results in large gaps to form between a foundation and the soil around it. 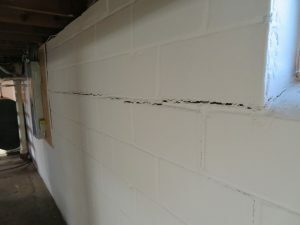 These gaps create a change in pressure or support around the basement, and leave a void to easily fill with water should sudden precipitation develop, and will lead to water issues within your home. Watering the soil around your foundation during periods of drought will help prevent severe gaps from forming. A sump pump is a household appliance that people don’t normally check or maintain – until something goes wrong. The following are tips to keep your sump pump in good working condition and be prepared for a failure. 1. Always have a second pump on hand. If your pump should fail, you want to get a new one operational as quickly as possible. You won’t want to waste time running to the store to buy a new one in an emergency. 2. Install a secondary pump. They can be installed in the same sump hole as your first pump, or install in a secondary pit. The secondary pump should operate on a different power source than your original. Battery operated and water pressure systems are two great options. 3. Be sure to clean debris out of your sump hole. Foreign items in the pit can interfere with your pump’s float and overall operation. Every sump hole should have a cover. 4. Check where your pump is discharging. Disconnect flexible sump hoses in the fall, and check that your hose is free of obstruction before reconnecting in the spring. Had a great experience with Nordic Home Inspeciton! Lars was very professional, thorough, and informative. Had the inspection report out so quickly! Highly recommend this inspector. Thanks! Very professional, knowledgeable and friendly. I can honestly recommend Nordic Home Inspection to every buyer and Realtor in the area. My experience with Nordic Home Inspection was excellent. Lars is a professional in all areas. I would recommend Nordic Home Inspection to anyone who wants a thorough, detailed home inspection. March 23rd, 2011 10:21 am Lars was very professional and thorough. It was a very detailed inspection and report. I would give him a very high recommendation. October 6th, 2011 9:44 am Lars was very informative about all of the tests he performed and things he was looking for. 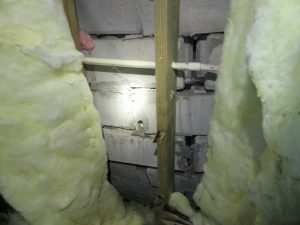 I would recommend Nordic Home Inspection to anyone. Amazing service, quick appointments, excellent communication. So glad we were able to have them come to our house. Used this company for a commercial inspection and were very pleased with how thorough he was and the things he caught. would definitely recommend. Lars is very responsive and thorough. I couldn’t ask for better service. For more tips, advice and stories Like us on Facebook!